Amarillo Gear Company designs and manufactures one of the most extensive, purpose built product lines for an array of industries including: power, agricultural, HVAC, and petrochemical. Amarillo Gear Company designs and manufactures purpose built product lines for numerous industries. Amarillo Gear Company’s cooling tower gearboxes and drive shafts have design features and ratings that ensure reliability and long life in the demanding environment of a cooling tower. Amarillo Gear Company’s irrigation pump drives have been trusted to deliver power to farmers around the globe for generations. Our pump drives are made in the U.S.A., with only the highest quality materials and components. Lives and property around the world depend on Amarillo Gear Company’s fire water pump drives for their protection. Amarillo Gear’s fire pump drives are listed by Factory Mutual (FM) for use in fire protection systems, and meet the NFPA fire protection standards. Amarillo Gear offers the most technologically advanced design of parallel shaft fan drives, providing unsurpassed reliability, reduced maintenance, and minimized cost of ownership. If you own an Air Cooled Condenser, you don’t know reliability until you know Amarillo. Amarillo Gear Company’s robust barge pump drives play a key role in the transportation of liquids along America’s coastal waterways and rivers. Just like the barges they serve, Amarillo Gear’s Barge Pump Drives are made in the U.S.A.
Amarillo Gear Company’s purpose built gearboxes are designed to perform when Mother Nature is at her worst. Amarillo Gear’s Industrial pump drives are available in sizes capable of transferring substantial amounts of power necessary for moving large volumes of water. We design and manufacture the world's largest range of industrial spiral bevel gears. Amarillo Gear has manufactured spiral bevel gears for over 80 years, in standard pitch diameter sizes from 3.5” (110 mm) to 24” (610 mm). All gear processes are “in-house” and controlled by internal quality processes which are certified by LRQA to ISO 9001:2008 standards. Many sizes and ratios are in stock for immediate delivery. If you need large diameter spiral bevel gears, Amarillo Gear is your choice. We manufacture spiral bevel gears up to 100” (2,540 mm) in pitch diameter. We will either manufacture to your design, reverse engineer or create a new design to meet your large diameter spiral bevel gear application. Helical gears are available from Amarillo Gear in pitch diameters up to 31.5” (800 mm), face widths to 15.75” (400 mm) and diametrical pitch starting at 1.588” (40 mm). All helical gears are machined, hobbed, carburized and profile ground by Amarillo Gear with AGMA quality levels of Q12 and higher. Advanced Products. 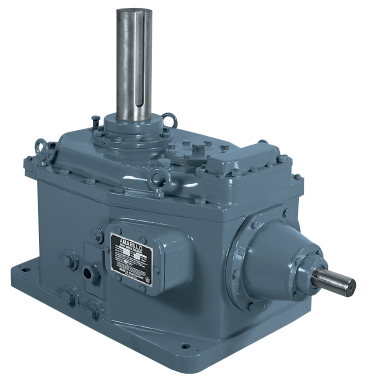 Our customers have come to expect reliability from their gearboxes due to our advanced, in-house design and manufacturing techniques. Service. We back up what we sell. Our customer service department is happy to assist you in providing the information and parts you need to keep your equipment running smoothly. Reliability. Our products are made with quality materials, innovative design, and exceptional manufacturing, allowing us to consistently provide you with gearboxes that function reliably. Availability. 24/7 service, shortest lead times and best customer service makes owning Amarillo gearboxes a smart choice. Simplicity. Easy to use selection and sizing. Amarillo; where else can you select your gearbox in less than five minutes? ©2018 Amarillo Gear Company. All rights reserved. A Marmon/Berkshire Hathaway Company.